You may think ice cream is off-limits if you've recently been diagnosed with diabetes -- especially since many varieties are high in sugar and cause your blood glucose to rise rapidly. If you're looking for sugar-free varieties that don't raise blood sugar, the bad news is ... there aren't any. You can find ice creams labeled "no sugar added." However, these contain carbohydrates and naturally occurring sugars, which raise blood glucose. The good news is you can still fit ice cream into your diabetes meal plan. 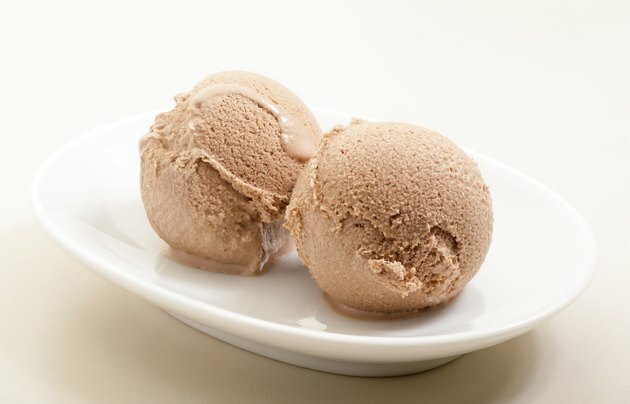 The "no sugar added" varieties of ice cream are sweetened with sugar substitutes such as sugar alcohols and sucralose, better known as Splenda. However, this doesn't make them sugar-free. Most "no sugar added" varieties are made using milk, which contains lactose -- a naturally occurring sugar. In addition, some sugar substitutes contribute carbohydrates and raise blood sugar, though not as dramatically as table sugar. What's more, some people find the taste of ice cream sweetened with sugar substitutes unpalatable. People with diabetes aim to eat a predetermined, consistent amount of carbohydrates at each meal -- 45 to 60 grams is about right for most people, according to the American Diabetes Association. It's common to think that you must avoid all forms of sugar when you have diabetes, but this isn't the case. As long as the total amount of carbs at a given meal remains within your target, you can fit sweet treats in every now and then. Eat sweets with your meal, instead of separately, so that you're consuming nutritious components such as protein and fiber, which help stabilize blood sugar. Make adjustments in your meal when planning to compensate for the ice cream. For example, if you're used to having a white potato with your meal, swap it out for the ice cream so that your total amount of carbs remains within 45 to 60 grams, or whatever target your doctor set for you. When you're ready to have ice cream, look for varieties with no more than 150 calories, 5 grams of total fat, 3 grams of saturated fat, 20 grams of carbs and 100 milligrams of sodium per 1/2-cup serving, recommends "Diabetic Living" magazine. The staff conducted a blind taste test and found diabetes-friendly ice creams that met the recommended guidelines. The winners of the light vanilla and light chocolate category were Breyers Smooth & Dreamy 1/2 Fat Creamy Vanilla Ice Cream and Blue Bunny Hi Lite Chocolate Ice Cream. The runners up were Blue Bunny Hi Lite Vanilla Ice Cream and Breyers Smooth & Dreamy 1/2 Fat Creamy Chocolate Ice Cream. What Can a Diabetic Eat at McDonald's?